The CAP 100 is an excellently well-made pedal, but the downside is it comes at a big, big cost. The rise of kit players adding a cajon to their rig means we're now seeing companies put out bass pedals, offering drummers the opportunity to play traditional rhythms between their hands and foot. Today we have just such a pedal from Schlagwerk. The German company has been a recognised big daddy of the percussion world for several decades, and now thanks to a deal with Headstock Distribution we're seeing its wares all over the UK. 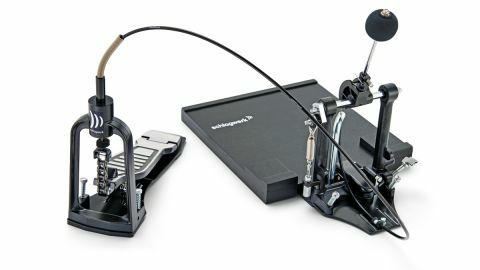 The CAP 100 pedal arrived with us packed away in its surprisingly heavy-duty carry case. Once out of the case we can see that the pedal is operated via a cable, allowing drummers to position the beater against the cajon tapa with the pedal off to their right or left. A baseplate fitting cajons of up to 30cm x 30cm is also provided. Setting the pedal up takes a matter of seconds. Adjustments are also a doddle - non cajon players won't be bamboozled here, if you've ever used a bass pedal then you'll have no worries whatsoever. The cable system immediately feels reassuringly sturdy. We recently reviewed the Ruach Music Live range and found its internal bass pedal to be a tad underpowered, but this is anything but. The soft beater is just hard enough to deliver a solid sound but soft enough to ensure that you're not blasting a hole through your cajon. Speaking of that beater, it delivers a delicious thwack to the tapa, rather than the tinny tap that you might be expecting from a pedal like this. It offers up decent response, whether buried from a real thud or feathered for a quick-fire response. Frankly, in its performance the CAP 100 blows the competition right out of the water. We tested the pedal on Schlagwerk's X-One Fingerprint cajon, but with fairness in mind we also team it up with a competitor's cajon and find the performance to be every bit as impressive. No doubt this is a cracking product that once again shows the huge demand that is out there for cajons. Okay, so where's the catch? Well, how about the price tag. At £149.99 it is incredibly expensive and possibly out of reach of many of the curious kit drummers that have picked up a cajon to see what all the fuss is about.